Satisfy the meat and potato lovers in your family with our grilled rosemary steak and baby Yukon potato Kebabs! Serve alongside our Classic Caesar Salad! Preheat grill to medium-high. If using wooden skewers soak in water for 20 minutes. Toss steak with 2 tablespoons olive oil and 1 tablespoon rosemary; season with salt and pepper to taste. 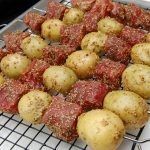 Allow to marinate while you prepare the potatoes. Place potatoes in a large microwave-safe bowl. Poke a small hole in each potato. Cover and microwave until just tender, about 6-8 minutes. Set aside until cool enough to handle. 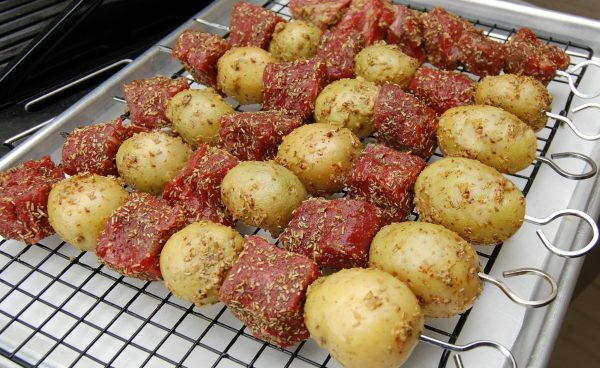 Toss potatoes with 2 tablespoons olive oil, 1 tablespoon rosemary and mustard; season with salt and pepper to taste. 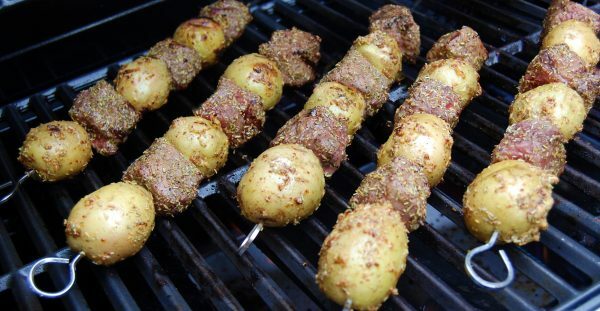 Thread steak and potatoes onto metal or wood skewers. Grill, turning occasionally, until steak is medium, about 8 minutes. Serve skewers over a Caesar salad with steak sauce, if desired.